Is the Moon polluting your gamma-ray data? I’m going to go ahead and give away the punchline: the answer to this post’s title is, “If your source is within 8 degrees of the Moon, quite probably.” — at least according to this paper. Read on to find out why! Gamma rays are extremely high-energy photons (we’re generally talking GeV to TeV range) that are produced as a result of a variety of astrophysical phenomena, such as dark matter annihilation, exploding stars, pulsars and magnetars, and much more. We’re pretty well-shielded from most gamma rays here on Earth due to our atmosphere — something which is convenient from the standpoint of not getting irradiated, but inconvenient if you’re a gamma-ray astronomer trying to get data. Luckily we’ve got space telescopes for this purpose, and Fermi/LAT has been doing a fantastic job of getting us lots of gamma-ray photons to analyze. One thing that we’d love to get more data on is gamma-ray binaries. If we look at the sky in X-rays, we see lots of binary systems that include a compact object accreting matter and emitting in X-rays. In gamma rays, however, we see very few binary systems. We’re not sure whether this is because they don’t exist or because we just haven’t yet identified them, so we’re trying to do a better job of pinning that down — which means doing lots of searches of Fermi/LAT data for gamma-ray sources with periodic modulation. Astronomers often monitor astrophysical objects and systems of objects over an extended interval of time and then use a Fourier transform to change that data from a function of time into a function of frequency. This lets us see if any part of the spectrum is varying periodically — which is particularly useful in examples like pulsars, where the object we’re viewing is rotating, or in cases like binary star systems, where the objects are orbiting. If you take the Fourier transform of the light coming from a binary system and calculate the power spectrum from it (this will basically tell you how much signal there is at a given frequency or period), you would expect to see a spike in power at the period that corresponds to the orbital period of the binary. You’d also see a series of related spikes in the power spectrum corresponding to the harmonics of that period (i.e., at T/2, T/3, T/4, etc. where T is the period). So finding this signal in your Fermi/LAT gamma-ray data is usually a good indication you’ve found a gamma-ray binary. The catch: what if that characteristic signal you’re picking up has a period of 27.3 days? Guess what the Moon’s sidereal period is? Yep, 27.321 days. Houston, we have a problem. Two examples of sources that display periodic flares every 27.3 days, an indication that the moon is contaminating the data when it passes near the sources. Seriously, how could the Moon possibly be producing gamma rays? That was the first thing I asked myself when I read this paper, anyway. The Moon’s just a cold rock sitting out there … aren’t gamma rays only associated with energetic phenomena? Well, they say it takes two to tango, and it turns out that the Moon is only the second half of the gamma-ray production team. The first half takes the form of the extremely energetic particles continually pervading space as cosmic rays which, when they interact with the Moon’s surface, generate enough gamma rays to be able to significantly influence Fermi/LAT data taken nearby. 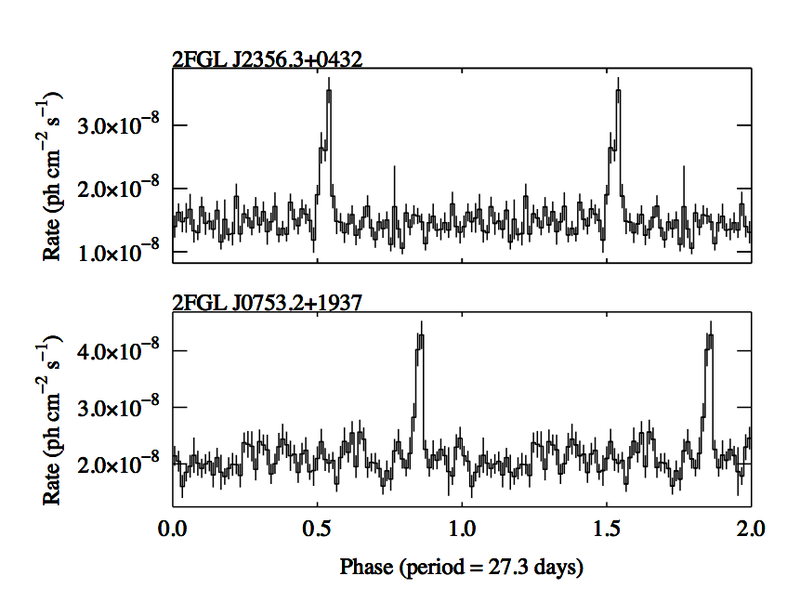 The authors of this paper specifically show us two gamma-ray sources detected by Fermi/LAT that demonstrate “flares” every 27.3 days (see figure to the right). These flares can be understood as the point where the Moon passes close enough to the sources to affect their light curves. Fermi/LAT data is not annotated to point out sources that are potentially affected by the Moon, so the authors make it clear that gamma-ray astronomers need to be careful of this hiccup. 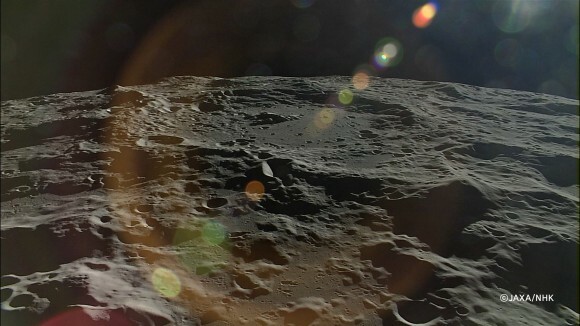 The authors used a harmonic-summing technique in order to better identify the sources that were clearly affected by gamma-ray emission from the Moon, coming up with a total of 38 sources from the most recent list of all Fermi/LAT-detected sources. They conclude that any data taken when the source was within 8 degrees of the Moon on the sky is generally contaminated by lunar gamma-ray emission, and should be excluded. So that gamma-ray astronomers can manage this problem, the authors have created publicly-available software that determines whether a Fermi dataset is contaminated by lunar gamma ray counts, making it possible to filter out the lunar foreground. And with that filter in place, let the search for gamma-ray binaries continue!